The track came out to be as the predictions; wet with persistent overnight rain which continued throughout the race, and the start was delayed by 10 mins before starting behind the safety car. But just after 3 laps the race was Flagged Red and remained that way for another 40 mins or so before restarting behind the safety car which remained on the track for 17 laps. Lap 18 was the first lap without the safety car and Vettel started to pull a gap over his team mate Webber and rest of the pack. On Lap 19, Webber crashed into the wall before slipping back on to the circuit to take out Rosberg too, who after seeing Webber crashing into the wall tries to avoid him by going on the grass but luck was not on his side. Safety car was again needed to remove both the cars from the circuit, and it remained for another 4 laps before the racing restarted, again Vettel made a great start and began pulling out on Alonso who was on 2nd and others. while Trulli, who already had suffered a spin and collision with Senna, returns to pit with technical problems which he had sustained during the collision. Neither of these incidents caused any interruption in the race but on Lap 30, another Safety Car was needed when Buemi first tipped Heikki’s Lotus into a spin before crashing into the Virgin Glock’s at the end of the long straight, retiring him immediately while Glock retired a lap later. Vettel and Alonso pitted under safety car, with Vettel retaining his lead as Alonso suffered some problem with the right front wheel change, giving the lead to Hamilton who gave it back at the restart as he ran wide at turn 1. Vettel this time could not make the same kind of lead but was still ahead. On lap 39, Petrov’s Renault crashed in the final corner. 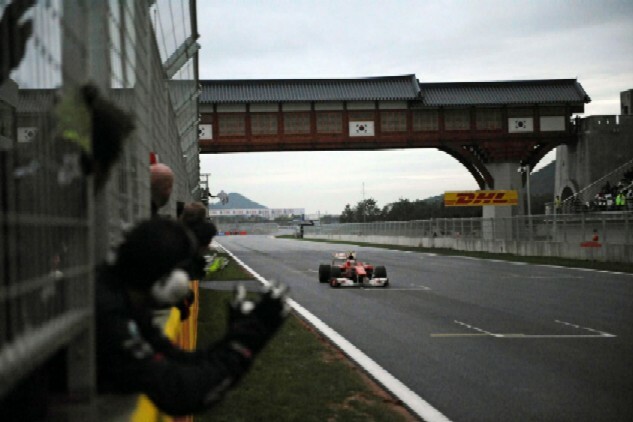 Vettel’s engine blew on lap 45, and Alonso took the lead with Hamilton on 2nd, Massa on 3rd. Just before his crash, Vettel said on the radio to his team that it is starting to get dark and they should end the race now. On Lap 46, after several laps of battle with Heidfeld and Kobayashi, Sutil finally tried to overtake and crashed in Kobayashi’s car but amazingly only Sutil retired with a broken suspension. Kobayashi did not suffer any serious damage. While Michal has another best race of this season as he equals his best result of the season with another 4th place finish. Kubica was on 5th with Liuzzi on 6th, Barrichello who was going strong at 5th for the whole race until just few laps before the finish, he lost tires and 2 places to finish on 7th, both Sauber’s again finishes in points with Kobayashi 8th and Heidfeld 9th and Hulkenberg just like his team mate suffered tire problems and then a puncture for which he needed to pit, was the last at the top 10. Alguersuari finishes 11th ahead of Button whose title hopes also ended with 12th place finish. Heikki finishes again ahead of the new teams although he suffers a pit lane speed limit penalty but HRT takes the crown for both drivers finishing the race, while RedBull and Virgin both suffer double retirements. A post race investigation for 2 separate incidents caused by Buemi and Sutil has been done. Buemi was penalized 5 place grid penalty for causing an avoidable collision with Virgin’s Glock while Sutil not only penalized for his crash with Kobayashi but was also handed a $10,000 fine for driving a car with brake problem. The next race is in Brazil and most likely the title will be decided in that race, but I hope the title should go down to the last race in Abu Dhabi, just as a tribute to the really exciting and amazing current season.